Finally! 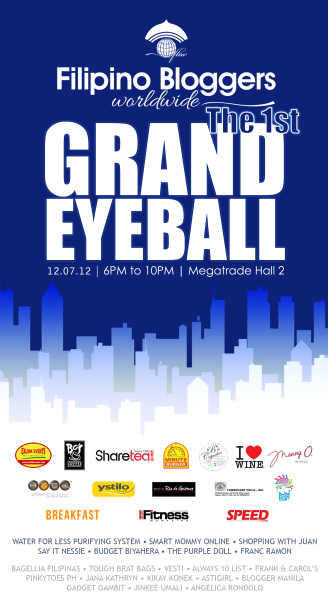 After over a year of inception, Filipino Bloggers Worldwide (FBW), in partnership with Ex-Links Events, presents Filipino Bloggers Worldwide: The 1stGrand Eyeball. Filipino Bloggers Worldwide: The 1st Grand Eyeball is brought to you by Filipino Bloggers Worldwide,Ex-Link Events, Bo’s Coffee, ShareTea Philippines, Minute Burger, B’s Cupcakes, Water For Less Purifying System, Manny O. Wines, Breakfast Magazine, Total Fitness Magazine, Speed Magazine, Azta Urban Salon, Ystilo Salon, Beauty by Ria, Bagellia Filipinas, Tough Brat Bags, VESTI, Always 10 List,Frank & Carol’s, PinkyToes PH, Jana Kathryn, Kikay Konek, Astigirl by Tweet Sering, Blogger Manila,Gadget Gambit, Towercamp Phils., Inc., Touch the Sky Graphics, Jinkee Umali, Angelica Rondolo, Say It Nessie, Budget Biyahera, The Purple Doll, Franc Ramon, Shopping with Juan, and Smart Mommy Online. We will be using the Twitter hashtag - #FBW2012 – all throughout the event. If you want to be updated about what’s happening, do make sure to follow the hashtag! Wow! Sana makahabol ako! I would like to attend this event, I want to mingle with my fellow bloggers. Looking forward to attending this event. It will be a very good opportunity for the members to mingle with the fellow FBWers. Thanks for making this meet possible. wow wish to be there..kaya lang malayo talaga..no budget pa...good luck to all and have fun during the gathering. Me too, gusto ko talaga pero malayo din eh. Have no budget this time. Sayang! Wow, it sure would be a grand eyeball! Please post photos of the event, mommy Tess.. I don't know most people from this group but I know how bloggers can be close even though we just meet virtually... so I can imagine how fun it would be to meet each other in person. hey, I want to come...this is really exciting! 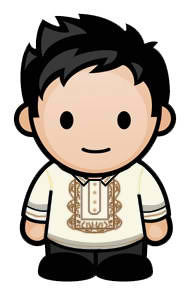 I wish Philippines is an hour away. I wish you all the best and successful boggers' event. I wish I can go. Oh, wish I could attend as well. Good luck! Very nice! This will be a great event and to finally meet fellow bloggers that you've only encountered online for the long time :-) Pretty sure you will all have a blast. I hope you all had fun. If only I knew about this event earlier, I would definitely come. events like this are indeed a great way to find people with common interest. would love to go but too bad were miles away from manila. Sayang, di ako nakapunta. Sana gawing yearly ito Ma'am Tess. wow...so how was it mommy Tess?..im sure it was fun and merry. congrats FBW...looking forward for the 2nd EB..
Sana meron din niton ngayong summer at sana may mga tours. Parang socialization. This is great! Can they organize another event this year? I'm just a newbie blogger and I would like to learn from those veterans. I'm sure it will be fun. I want to ask if you guys know an existing group such as Filipino writers community or whatnot, I would be delighted for replies regarding this query.